The stream started pre-wall ... and showed a young Zavala being awoken by his ghost. It then went on to show him fighting, discovering the Traveller, meeting people in the settlement below the Traveller, defending the settlement against enemies and then helping to build the wall and then overlooking the finished project. It sounds absolutely crap when I say it in a few short words. Go find it on YouTube its about 2 minutes and you'll be left wanting more when it finishes. 1. "A world that pulls you in" - this is about a story you can relate to, characters that you want to hang out with and work with, having enemies to face. 2. "Amazing things to do" - this is amazing things for everyone no matter your mood. If your a solo player we're changing the way exploring the world works, if your a competitive player they have re-thought the Crucible from first principles. 3. "Always someone to play with" - the raids in Destiny 1 couldn't be experienced by everyone, 50% of people who reached the level cap managed to organise fire teams and complete a raid. That means that tons of players (50%) never had the opportunity to experience Destiny's most unique content. Now we're going to make it that Trials, Nightfall and the raids will finally be available to all players. 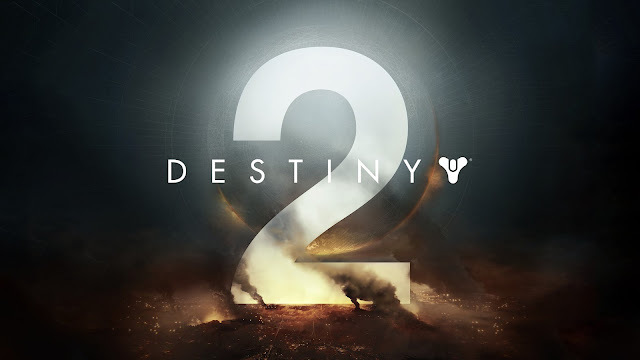 Destiny 2's vision boils down to this one statement: "It's a world I want to be in"
Luke then introduced "Homecoming" which is the first mission in Destiny 2. It begins with Cayde asking Ikora if she is playing a practical joke and that if she was - he would be impressed. You can see that there is also a raging lightening storm outside too. Zavala asks Ikora for an update and she mentions that something or someone has sabotaged the Skyline defence systems. Cayde also mentions that comms have been spotty for the last few hours and that every sensor beyond the wall has gone dark. As Zavala walks towards the large window to view the storm, Ikora gives another update saying that there are no results coming from the satellites because they are no longer there!! As another lightening bolt strikes it lights up the storm and hundreds (maybe thousands) of Red Legion ships can be seen coming towards the tower/wall. As Zavala yells "Battle stations!" the ships shoot rockets/torpedoes towards the tower and wall. Zavala activates a Ward of Dawn and yells for everyone to get to him as the tower explodes around them. The camera then pulls back as the ships descend on the city and a large finger looking ship starts to "grasp" the Traveller. Gameplay then starts ... I won't describe the entire mission but as normal it's the first mission and is relatively easy so you can get used to the controls and new options/weapons etc. The objectives are simple - such as 'defend the tower from 3 waves' 'get to the speaker' etc ... Zavala then sends Amanda Halliday to pick you up to take you to the Command Ship to de-activate the shield generator. You get to the shield generator room and it's pitch black and a ghostly figure laughs and states: "Your journey ends here". This ends the gameplay and Luke Smith joins us back on stage. He says "If the giant burning 2 isn't enough of a clue - spoilers we lose!" Destiny 2 is a game that opens with lose. With one fell swoop players loose their powers, their home and most important of all their vaults. Luke then introduces another scene that shows Cayde fighting through an onslaught of Red Legion enemies. There are also snippets from the behinds the scenes people (project leads, lead writers, community head etc) giving comments on what the story is about. They tell us that Dominus Gaul is jealous and wants the light for himself, because he thinks he should have been chosen. He puts the Traveller in a cage and instantly all Guardians loose their powers. They can't walk, only stumble. The tower is lost, the vanguard are scattered ... whether you're a titan, warlock or hunter - you are the hero of this story and you need to get your powers back. There are also more story missions and cinematics that ever before. There are new world to explore, new strikes, new raids, new weapons, new armour and a pile of brand new exotics. They have also re-designed the weapons slots. There are also new supers too. The dawnblade, the sentinel and arcstrider. - Campaign "The Red War" - this will send you all over the solar system and to all new worlds. - Crucible - big changes have been made 4vs4 across all the game modes, re-designed HUD and new maps. - Worlds - all new activities can be launched from a world and you don't have to go to orbit, patrols still available, public events, chests, now adventures, and lost sectors available. Also people to meet and side missions to do. - Map - map has been redesigned and all public events, lost sectors show up on your map. EDZ (European Dead Zone) - the largest they have ever built, they have built a refuge there where you can go. Titan (a moon of Saturn) - you will find Zavala here, it's a planet with a methane ocean and 40ft waves with an old human settlement there. Nessus - almost entirely turned into a machine world by the Vex. You will find Cayde here. Io - (sulphuric yellow moon of Jupiter) - this is the last place in the solar system that the Traveller touched before the collapse. A very sacred place to Guardians especially Warlocks and Ikora (you'll find her here). We are then introduced to M.E. Chung (social lead) who talks about her experiences of gaming and that the best experiences have always involved other people. She tells us that "Clans" are coming into the games. She tells us that Clans could only be co-ordinated outside of the game up until now because they will be bringing official clan support into the game. The want to make it easier and simpler for us to manage the clans. They will add in-game rosters and tools for us to built fire teams. There will also be custom banners for the Clans too. They are also adding a reward system that is shared by every member of the Clan. They have also added a system called 'guided games' which allows single players to be matched with clans (who have opted in) so they can play together and so that solo player can have a chance to experience all of Destiny's content. You can also (if someone leaves your party at the last minute) open up your party to guided games so you can find someone to fill the void in your fireteam. We then move to another cutscene where they talk about clans and guided games in more details with comments from the creators. Mark Noseworthy joins the stage and talks about Destiny and how it allowed him to reconnected with an old school friend. He spends some time talking about how Destiny is for playing with friends, finding friends, loosing yourself in the game and spending hours playing it. He then introduces the "Official gameplay trailer" which is mostly snippets from the "Homecoming" mission but just shorter. Eric Hirshberg (CEO of Activision) is on stage and does the thanks to Bungie and all the people who have talked today. He also thanks all the Bungie people who weren't there today. He also talks about the Beta later on in the Summer. He also talks about Sony and their support since the start of Destiny. He goes on to talk about the PC fans and that they have already announced that Destiny 2 will be on the PC but not where you can find it. We then cut to a Blizzard rep (forgot his name) on video chat and he tells us that Destiny 2 will be available on Blizzards online service "Battle.net" - if you play WOW you will be familiar with this system already. Mark thanks everyone again and thanks the people in the audience and the people at home too. He then ends the stream and tells everyone in the room they can go play Destiny 2. 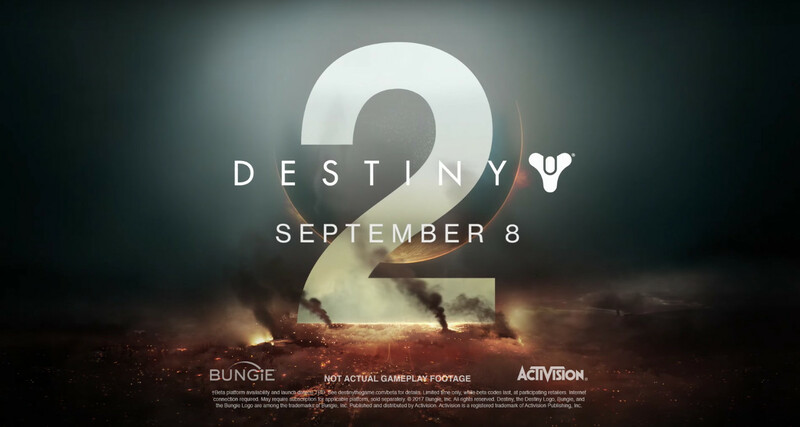 I am so excited about Destiny 2 and can't wait until September 8th. Let me know in the comments below if you watched the stream and what you thought.